When hiking in remote areas, even the most advanced hiker is just one wrong turn from being completely lost. Losing your way can be a terrifying experience, but the best way to survive is to remain calm and remember a few basic rules that are essential in finding your way back or being rescued. One of the most important steps in being found begins before you leave. Whenever you are hiking it is important to tell someone where you are going and how long you will be gone. The more specific you are about your plans, the better your odds of being rescued if you do become lost. A detailed itinerary of the trails or areas you will be hiking, along with a return time, is ideal. If you become lost and do not return at a specified time, someone will know and they will have a good idea of where to look for you. Another important step in pre-hike planning is to bring a compass and topographic map. Do not rely on GPS or your phone to get you out of a bad situation. It is dangerous to depend solely on technology, especially when hiking remote areas. 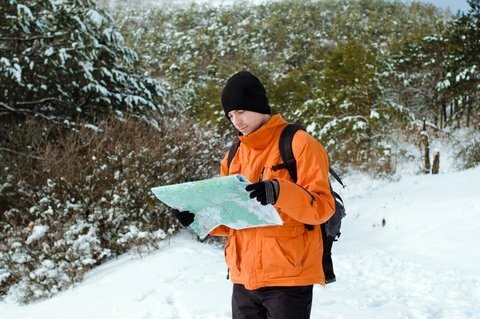 A compass and map are simple, reliable tools that could save your life. If you discover that you are lost, the most important thing you can do is remain calm. Staying calm helps you think clearly. Panic clouds your reason and leads to poor decisions that can make your situation even worse. Once you have reached a calm place, you are at a point where you can evaluate your situation and devise a plan of action. If you have no idea where you are and no means of orienting yourself to safety, the best plan is to stay where you are and wait for someone to find you. You can increase your odds of rescue by moving to a nearby clearing or high point, where you can be spotted from above. Start a campfire. This is important for staying warm and the smoke will make it easier for searchers to find you. If you have a compass and topographic map, and feel confident in orienteering, this is the point where you can begin looking for landmarks. Large hills, streams, lakes and valleys can all be important visual landmarks that will help you pinpoint your location on a topographic map. If you are able to confidently determine your location, use your compass to help you navigate in the right direction. As you move, remain vigilant about watching the map to make sure what you are seeing matches what is on the map. Whether you choose to remain stationary and wait for help, or try to orient your way to safety, there are some key factors that you should address that will improve your odds of survival. The first is water. It is important to stay hydrated and drinking water at regular intervals will prevent dehydration. The next is staying dry/warm. If it is raining, find the driest place possible. If you are cold, start a fire and/or bundle yourself in whatever clothing you have. If you do not have extra clothing, cover yourself in dried leaves or grasses. This will help insulate you and keep you warm. It is also important to sleep if you are tired. Exhaustion can lead to poor decision making, which can make a bad situation worse. Finally, if you are waiting for someone to find you, it is important to stay busy to stave off common problems such as loneliness and fear. Build/maintain a fire, build a shelter, create signals that will help rescuers spot you. This will make you feel like you are doing something proactive and take your mind off the negatives of your situation. Following a plan and remaining calm are the keys to surviving when you are lost. If you can remain calm and focused, you will dramatically improve your odds of being rescued or finding your way back.